Beavering away is the best way to describe activity this summer at the studio. The swallows in the eaves of the next door store room, chatter away all day long. When out flying their high pitch hum and song can be heard consistently in the summer air. They do inspire me as do the other birds and dogs which wander around and about to see what I am doing. It has been a busy summer so far for stained glass commissions! I have completed the ‘Autumn’ panel and am finishing ‘Winter’ of the four seasons for a local customer. They are all painted and etched using the English Antique glass which gives such a delightful light in all it’s radiance and beauty. I am currently working on four leaded lights with quadrilateral arches. They have a bright red textured border with small squares of pale turquoise and pinky mauve. They are custom made to be installed into two doors being made by a local joiner. I am working at the church at St Cyriac’s of Lacock with my colleague, cleaning and making recommendations for repairs. The leaded lights are covered in cobwebs and dirt from the ages, in some cases we to clean carefully three or four times with special tools. I am privileged to take photographs, which hopefully will be made into a booklet for the church or maybe some postcards for them to sell to the eager tourists. I have been asked to make a new stained glass for a church in Surrey, I won’t give too much away until the designs are approved, I am very excited as this is a new window. Something to really look forward to making and choosing some gorgeous Lamberts https://www.lamberts.de/en/and EAG glass http://www.englishantiqueglass.co.uk which I love to paint on. Designs and sketches are being energetically studied at the studio to form two compositions for stained glass. I love the Arts and Crafts movement of the late 19th century and hope to make my compositions as a homage to Edward Burne-Jones in 2019. I will post more detail about this exhibition shortly. 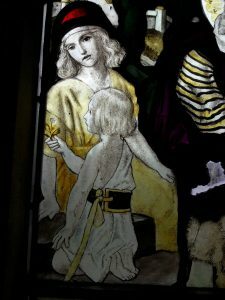 The little stained glass painting inset is from the bell tower window at St Cyriac’s, designed by George Parlby for T.F.Curtis, Ward and Hughes.